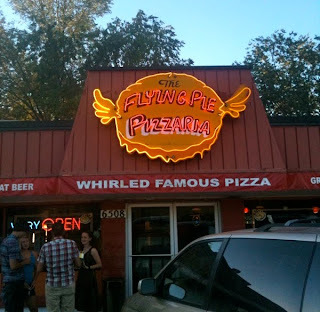 Flying Pie Pizzaria might be the best pizza I've ever tasted. It's the kind of restaurant where you spend the entire meal wondering, what is in this? what is that flavor? what makes this so good? Ceilings are low, dining room dark and musty--in summer it's downright muggy inside. Still, Flying Pie does a bustling business and turns out pie after tasty pie. This past August, I sat down with a solid house wine and savored an impeccable piece of veggie pizza. One qualification--the heat in the restaurant seem to gather in the center dining room and it became an unbearable inferno. Just to the right of the main door is a horn with a sign that reads, 'Honk the horn on the way out. It means you'll spread the word about your experience at Flying Pie.' The pizza was amazing; I honked the horn and the kitchen and wait staff cheered. I hope it isn't another 7 years between visits the next time around.